Denise Fujiwara, one of the most diverse talents to evolve on the Canadian dance scene is choreographer, dancer, actor, teacher and artistic director. Her solo dance concerts have won her international critical and audience acclaim. “Sumida River” is the haunting tale of a woman in search of her stolen child. Created in the striking Japanese modern dance-theatre form, Butoh, Fujiwara dances a delicately nuanced performance of a mother's journey. Deeply moving and utterly compelling, Sumida River takes us on a journey of love and surrender. Internationally acclaimed Butoh choreographer Natsu Nakajima has created this spellbinding solo, a contemporary interpretation of the renowned 15th century Japanese Noh play especially for remarkable Canadian performer Denise Fujiwara. Based on Motomasa’s 15th-century Japanese Noh play Sumidagawa, the source for inspiration is the widely known and tragic legend of a mother whose kidnapped son never returns. In Fujiwara and Nakajima’s use of sacred movement and their internalized approach, some elements of Noh theatre remain. "It has a Noh structure of jo ha kyu," Fujiwara explains. "The work starts very slowly (jo) and increases in complexity (ha) and then continues to climax (kyu) before returning to jo in the fourth section – to bring the audience back and prepare them to leave the theatre. The rest, adds Fujiwara, is pure Butoh interpretation. Rather than recreating the play with traditional narrative, Nakajima has infused contemporary dance into the structure to convey the very essence of the story itself – the tragic inner journey of a mother who has lost her child. The results are strong images and almost athletic movement, with costumes that slowly evolve throughout and a broad sound combining eastern and western music. "The intense emotional resonance of Denise Fujiwara's memorable, tragic solo Butoh work ... incarnated everything dance can express and communicate through the body where words cannot." Hour Magazine(Montreal). Could you describe your first meeting with your mentor and acclaimed Butoh choreographer, Natsu Nakajima, who went on to choreograph “Sumida River” for you. I first saw Natsu Nakajima perform at the Festival International de Nouveau Danse in Montreal in 1986. I witnessed in her choreography and performance, a deep sophistication and maturity that spoke from a woman’s point of view. At that moment I knew that I had to study with her. It would be 9 years before this goal was realized. How did you train under your mentor Natsu Nakajima? Was it a process of unlearning and reinventing yourself? Within 3 minutes alone in the studio with Natsu Nakajima I came to the crashing realization that nothing in my previous 15 years of dance training and professional practice would be of much use in the practice of Butoh. I found myself in an amazing new paradigm that had very different principles, required a whole new set of skills and different ways of thinking. I started over and it became a journey of revelations about the art of dance and life. It is incredibly freeing to become a beginner again. One can learn very quickly when there is no ego to impede the process. Sumida River is interpreted in the Butoh style, also incorporating the essence of Mai - the sacred internal dance of Noh. Could you tell us about Noh and Butoh as you practice it? Sumida River is inspired by the 15th century Noh play Sumidagawa. It is fitting that the choreographer sought inspiration from “mai” or the sacred, internal aspect of Noh theatre as a foundation for the work and this is an element of its performative style. 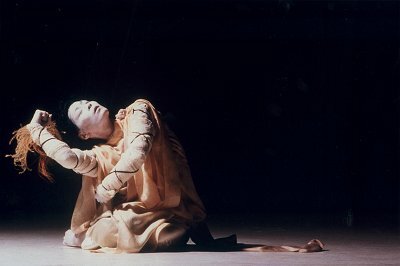 Natsu Nakajima was one of the first women involved in the Butoh movement. She was mentored by the two most important figures of Butoh, its founders Tatsumi Hijikata and Kazuo Ohno. She embodies Butoh in her dance. Like her teachers, she herself possesses a special genius as a choreographer and performer. It is a great honour to perform this work. You have said it took you over 5 years to incorporate all the concepts Natsu Nakajima taught you in “Sumida River”. How have your performances in this work evolved over the years? The performances of Sumida River have deepened over the years so that the performances are now more layered, have a greater life-force, a vividness that they did not have in the early years. Is the term Butoh now mainly used for ballroom dancing in Japan? Is "Ankoku Butoh" the correct term used now in Japan? The word butoh is made up of two characters, “bu”, which means to dance and “to” which means “to step” and was until the late 1970’s the word most commonly used to describe any non-Japanese form of dance. Ankoku means ‘pitch black”. Ankoku Butoh is the name given by Tatsumi Hijikata and Kazuo Ohno to the revolutionary dance -theatre movement they founded in 1969 and can be translated as “the dance of utter darkness”. The name was shortened to “Butoh” in the late 1970’s as the 2nd and 3rd generation of choreographers emerged and with aesthetic goals that had evolved away from the original founding principles. How do you intend to work with Indian dancers at your ten-day workshop in Chennai? Do you anticipate any challenges?! Butoh is a way of working from vivid internal conditions expressed through intense physicality. It is dance-theatre training that endeavors to reveal an inner life of authenticity and depth to express one’s humanity in all of its irrationality, ugliness, beauty and mirth. We’ll go on to apply this to the development of a short work of choreography. Challenges are an important part of the creative and learning process. I expect we’ll meet our fair share of them and that they will teach us a lot.